HP has come out with an awesome invention! As a parent, I take a lot of pictures with my cell phone. I’m not the best about printing the pictures. Yes, I admit the pictures will just stay on my phone or live on the hard drive of my computer. This doesn’t have to be a problem anymore. Currently available exclusively at Staples, these sticky-backed 4×5 inch photo sheets are perfect for printing, displaying and reliving life’s moments. Not only can you print directly from your smartphone or tablet, but you can decorate your space with your favorite social media photos. 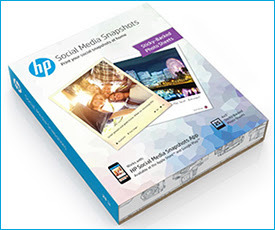 And the best part is HP Social Media Snapshots are easily removable, so they won’t damage your walls- and they’re re-stickable too! 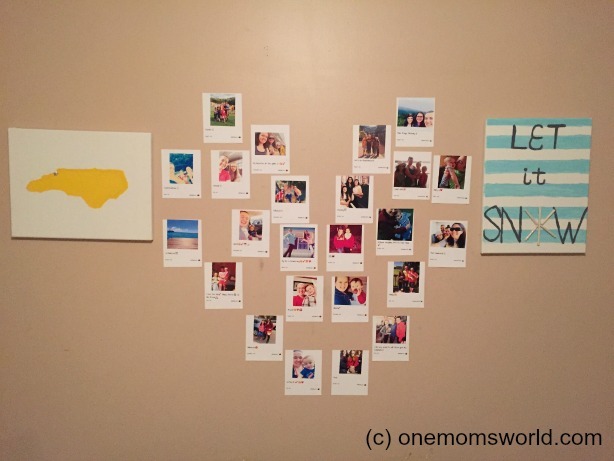 Check out Big Sis as she makes a photo collage for her bedroom. 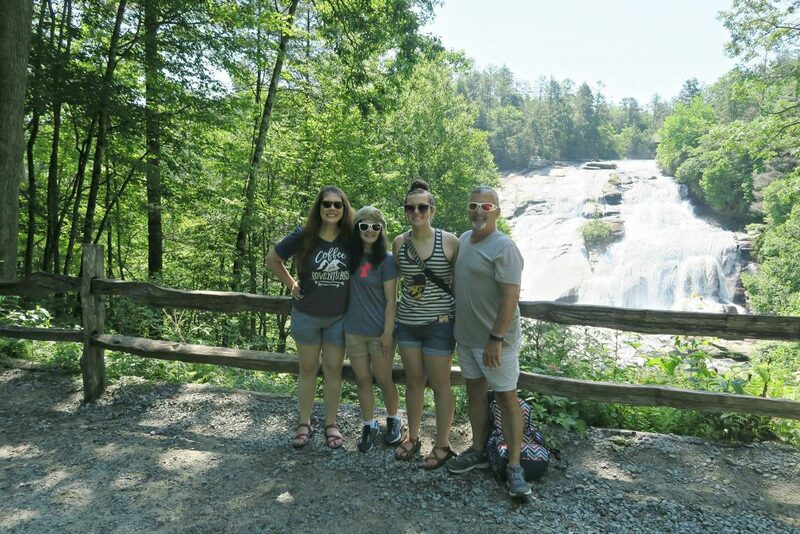 You will see just how easy it is to select photos, print, and stick! So cool right?! The projects are endless. 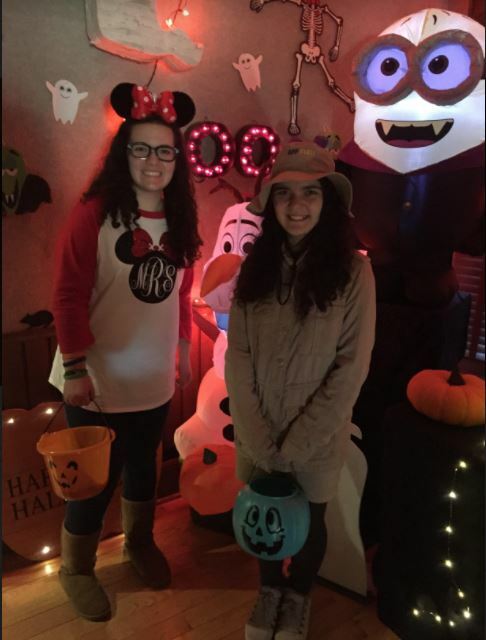 You can use this for birthday parties, holiday events, and how cool would this be for a photo booth? It’s great for a child’s bedroom as they can have pictures of their family and friends always close by. Disclosure: This is a sponsored post in conjunction with HP and Mom Select. As always, all thoughts and opinions are of my own. The creativity gene skipped me and went straight to my oldest daughter, M. She amazes me with the beautiful projects she creates for me. My husband and the girls came on campus to have lunch with me and I was greeted by this precious flower vase. The girls love Starbucks Frappuccino’s! I watch the coupons and try to find a good deal on them. In the last two weeks, I have been able to pair a coupon with the deal at Harris Teeter. The perfect summer treat for them. M decided she wanted to do something with the glasses. She soaked the glasses to get all of the sticky label mess off and surprised me with the flower vase. It goes perfect on my desk at work. Throughout the day today, I would look over at the vase and a big smile would stretch across my face. It is so simple to create this project yourself. 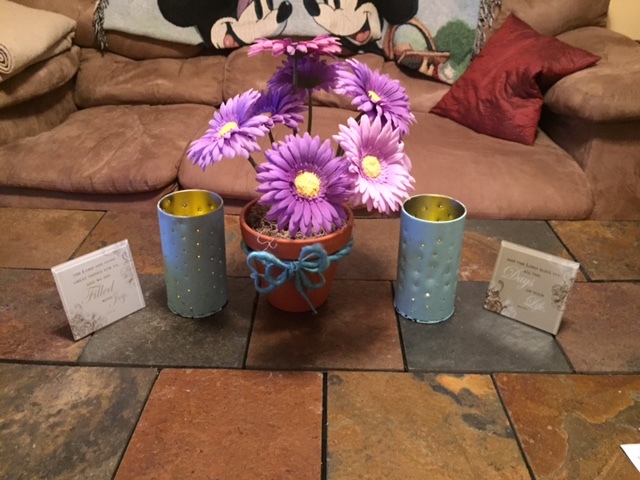 The marbles were on the 75% clearance section, the flower came from the Dollar Tree and she used ribbon to cover the top of the glass. Didn’t she do a great job? It is the refreshing look I needed on my desk! Check out these awesome #DIY lanterns! I love do-it-yourself projects. My precious M is the one that started the #DIY craze in this household. She started with her bedroom and now she is helping me with the living room, kitchen and L’s bedroom. 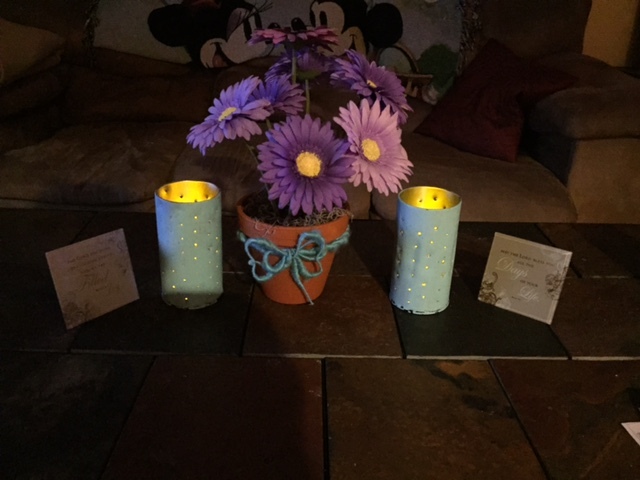 Her projects turn out so adorable and it is a frugal way to decorate the house. 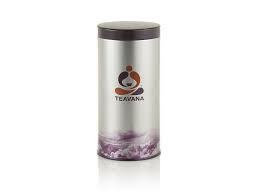 My co-worker gave me two of these Teavana tins. I didn’t know what we would do with them, so I brought them home to M and she immediately said: “Mom, let’s make lanterns.” Lanterns never crossed my mind but I was intrigued with the idea. She thought they would look cute on the coffee table. All she asked me, what color did I want them? Didn’t they turn out great? It brings a pop of “Spring” color to the living room. The pop of color comes at a great time with Spring just right around the corner. It has been a very cold winter. Don’t get me wrong, I love snow. The beauty it brings and the peaceful feeling, but I do love the Springtime temperatures and the refreshing feeling. She put water in the tins and put them in the freezer. This allowed her to make the nail holes. After letting the ice thaw, she painted the tins. We put a battery operated tea-light candle in the tins. It is such a cozy feeling in the evenings. It is amazing what a recycled product can turn into. I’m in love. I can’t wait to see her next project. My daughter M, is about to turn 12 years of age and she is very much into the DIY scene. Once she has her bedroom completed, I will show you photos. She does get her frugal side from me. We love to see how cheap we can purchase things. 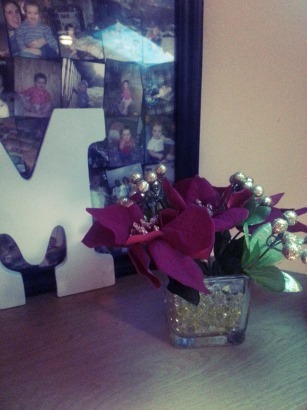 Over the weekend she decided she wanted a Christmas flower arrangement for her room. The finished design is above. It turned out beautiful. The entire cost: $4! How did she do it? We traveled to our local Dollar Tree. She picked out her vase, crystal beads (water bubbles), and flowers. The crystal beads were found with the air fresheners. Technically, the flower arrangement serves as an air freshener as well. 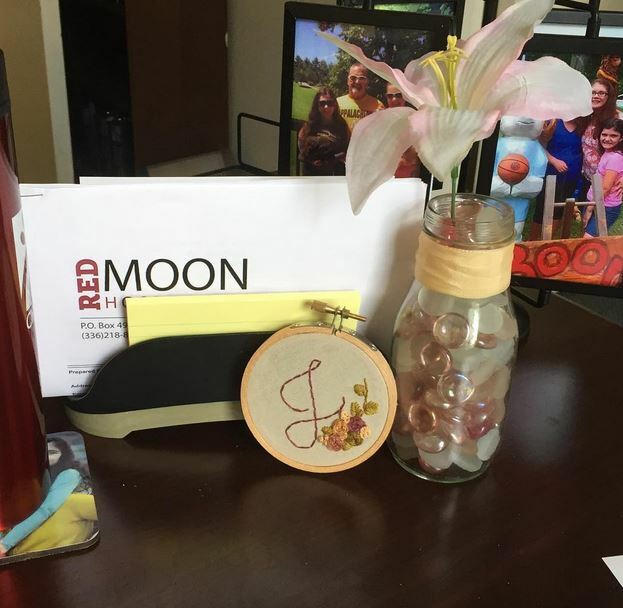 After we returned home, she went right to her desk and used scissors to cut the flowers how she wanted, poured the beads into the vase and arranged the flowers. Her plan is to make an arrangement for each season. I think it is a great addition to her room. You can’t beat the price.